The project that currently has my attention is a challenge for the Island Batik Ambassadors. I started by making a test block - just to get myself ready to start. Then I made some wonky star blocks. Over a few days it progressed along and I am at the quilting stage. Here is a little sneak peek - but the backing is mostly what you can see. The backing fabric did not come with the Ambassador program - it was in my stash. Wait? Are there white pieces in my blue blocks?? Do I need to rip that out? Do I quilt more on it or just trim and bind it? For now, it will sit while that decision is being made. 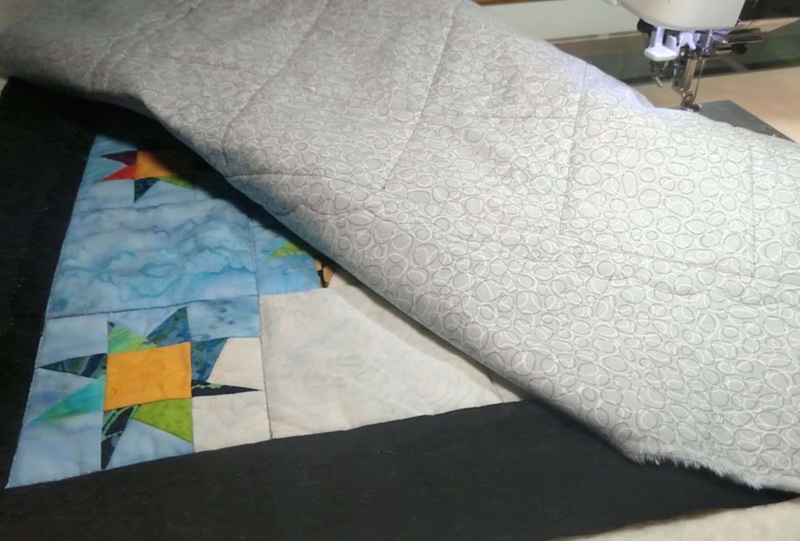 It depends on the batting you are using how close you need to quilt. Most Hobbs battings are every 3.5". I love their 80/20 batting. Such a teasing preview, who knows what should be done? Only those who can see it! I don't have a clue but they're petty! Congrats on becoming an IB ambassador. It will be fun to see what you design. Alas, I am not longer one but it was fun while it lasted. I love those wonky stars. I'm really looking forward to find out what you do with IB fabrics. They are so nice to play with. Have fun! This is very intriguing. Looking forward to the big reveal.